amanda returned my call at around 5pm and we scheduled a time for her to come by my house to pick me up so we can go get some dinner in harvard square. the last time amanda and i met in person was back in october. having never driven to my house before, it took a while for her to finally get here, i had to guide her for the final 2 miles via cell phone. what good is a fortress of solitude if it's easy to find, right? it was a historical moment when i finally got into the car because i don't think amanda has ever driven me anywhere before. we got to harvard square with some fears of maybe not being able to find a parking space, but sunday night at 8pm, there are parking spaces aplenty in the square. we found a spot by the harvard square common on garden street. initially we tried going for thai, but the thai restaurant i had in mind was no longer there when we got to the place. instead, we went with the old standby of pho pasteur in the garage. walking there, amanda told me the story of how she saw the special parts of one of the special patients of the mental hospital she's working at during the winter break when she accidently walked in on him in the bathroom. i won't go into details, but it's quite lurid yet inappropriately funny at the same time. we both had the chicken pho for dinner. amanda kept on saying how hot her food was because she accidently submerged her spoonful of hot sauce into her soup. by the end of the meal, all she had left in her bowl was a spicy red broth, but i had a lot of leftovers (i had a big dim sum meal earlier during the day). or maybe it's another example of my eyes bigger than my stomach. next time, order the small! dinner conversation centered heavily on work life past and present, the mutual friends we know, and my nonexistent love life. i revealed to amanda how to read secret messages in my weblog. amanda told me that she got her report card back for this past semester and she got all a's. i didn't realize i was in the presence of a smarty! when we left pho pasteur it was already starting to lightly rain. we quickly walked to au bon pain, where we both got the urban blend coffee. unfortunately it was cold leftover coffee and didn't taste good at all (maybe the urban blend is the cold leftover coffee), but fortunately it wasn't hot because while getting some sugar packets i accidently spilled coffee all over my hand and onto the counter. we sat by the window and watched the cold rain pick up outside. i gave amanda her present from turkey (a turkish t-shirt). she told me more about her work. i had thought she was an orderly in a hospital (changing bed pans, cleaning up after patients), but apparently she's only doing administrative stuff. i made a reference to the 1987 fat boys movie disorderlies and she jokingly asked if i was calling her chunky (i told her about my little problem at work). with coffee finished, we left to go back to the car, sharing the collapsible umbrella i bring with me wherever i go, dodging puddles, avoiding the splashbacks of nearby moving vehicles. it reminded me of another time i met amanda, right after i was let go from my last job. we made arrangement to meet in dtx for lunch in chinatown. there was a terrible rainstorm that day, we both got completely soaked but still made it to lunch anyway, and i remember i told amanda that we'd probably remember this day forever because we were both so miserable. maybe tonight will be just like that! anyway, i redirected her back to my house, and before getting out of the car, we promised to met again before she goes back to school at the end of january. when i got home, i turned on my vcr and watched the episode of alias i had timer recorded at 9pm. oh my god i am so in love with this show! the gilmore girls is quirky and fun, but alias has got me riveted. tonight's episode, sydney rescues her father, finally bonds with the old man but only to realize that he use to be a kgb secret agent 25 years ago responsible for the deaths of many american spies working in the soviet union. her cia handler wanted her to turn her father in, and we find out that her handler's father was one of the agents killed when her father betrayed the cia. but get this: final scene, we realized that it wasn't her father who was working for the kgb, it was actually her mother, now dead. all this time we were led to believe that her mother might've have killed by sd-6 because her father might've told her that he was a secret agent! i can't wait for next sunday. i'm going to be thinking about alias all week long! this day started with a strange dream*. in my dream i woke up too late for dim sum and i was totally freaking out, reaching for the phone to call laurie to apologize. just at that moment the phone rings. it's someone from work, she's calling to ask me questions about the project and give me a status report. i listen to her call and it sounds weird. i realize that she's actually standing right outside my bedroom, calling from a cellphone. so i invite her in and show her around my house. in this dream my dog mozart is still alive, and not only is he alive, he's very much active, jumping on chairs and tables. i'm sort of embarassed. after the tour i show her out. my dream ends, i wake up, and i am freaking out again, because i think i've missed dim sum. i haven't, it's still early, i go back to bed kind of confused but relieved. an hour later i woke up for real. i arrived in harvard square sunday morning 30 minutes early for my dim sum pickup, so i wandered around a bit again. on the mural of famous past hollywood stars on the wall of the church street sony theatre, i noticed the charlie chaplin depiction resembles sean penn. i went by the harvard lampoon building, one of my favorite building because the façade resembles a face. after making a round trip, i ended up back outside of au bon pain where i sat and waited, scribbling into my journal, my hands cold, listening to tunes on the mp3 player. on the other side of the street, a group of smartly dressed young koreans (do they wear any color other than black?) congregated in the pit. if i had to guess, and this could be a wild shot, i think they're meeting to go to church. when laurie arrived i hopped into the car, her friend lucy was sitting up front, and john, whom i didn't even notice was behind me, crawled into the back seat as well. we went to north cambridge to pick up yet another friend, carrie, whom laurie knew through her job. when we arrived at china pearl it was crowded. john spearheaded his way to the front of the line, trying to work his guanxi and get us a table for five without having to wait. we did have to wait a little bit, but he got us a table before our number was called. this was carrie's first time at dim sum, and she made the very true observation that much of the dim sum dishes are mushy. the final check came out to $50, which is about right for a party of five. after dim sum, john left to go shopping in dtx, laurie drove lucy back to her apartment, and everyone else ended back at laurie's place for some mild scrabbling. i saw her new cat for the first time, spider. she was also taking care of her downstairs neighbor's cat, gogi (means meat in korean), who looked very similar to her cat. 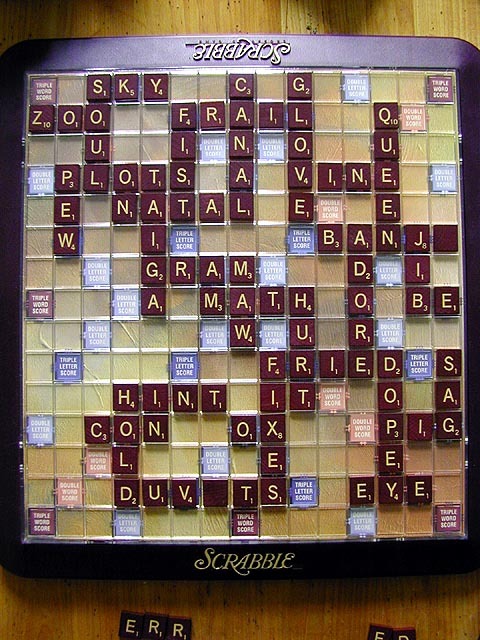 scrabble went off without any problems, there was no contesting of any words. i was particularly proud of my use of the word "taiga" even though it scored me very little points. in the end though, carrie came out to be the big winner - i think. or was there a tie between her and laurie? i don't remember, i just recall i lost. afterwards i got a ride to harvard square and came home via bus. * i've been having lots of vivid dreams recently. i'm not sure what it is, nothing's really changed in my life other than the fact that i'm perhaps sleeping earlier than usual. maybe following a sensible sleep pattern is inducing all these dreams. i don't mind though, it's pretty interesting.